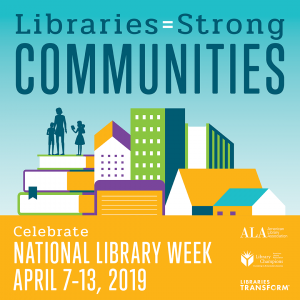 In celebration of National Library Week – April 7-13, 2019, Colorado libraries are pulling out all the stops to highlight the contributions of our libraries and librarians, and to promote library use and support. South Routt libraries celebrate National Library Week with a gift basket drawing! From April 8 to 13, those who check out a library item are eligible for one entry per day. The drawing will be held Monday, April 15. Call the Oak Creek Library at 970-736-8371 or the Yampa Library at 970-638-4654 for more information. Celebrate National Library Week with Nederland Library by sharing how you “library”! Email Library Director Elektra Greer with a response to any of the questions below and earn a gift certificate to Ncred’s Ice Cream….opening for the season on April 9! How do you think libraries make communities stronger? What aspect of the Ned library do you value most? What should be our Ned library mascot? 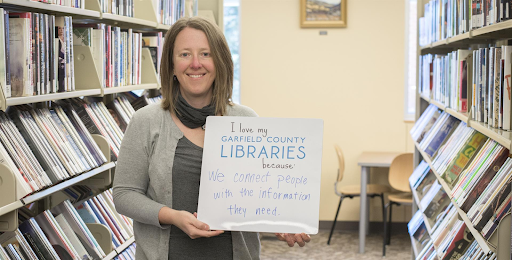 Amy Shipley, Assistant Director of the Garfield County Libraries – invites patrons to share their favorite memory with library staff on their next visit. The library is also invites community members to share Coffee with the Library Director on April 15 at 9:00 am and chat about the community, libraries, and collaboration on a bright future. Image courtesy of Garfield County Libraries. Pikes Peak Library District received a National Library Week Proclamation from the Colorado Springs City Council! I wasn’t sure what the significance of a proclamation was in this context, so like a good librarian, I looked it up. To wit, proclamations are typically issued to provide recognition for special events or significant issue, with the goal of raising awareness. The more you know! To celebrate National Library Week, Vail Public Library will again offer Amnesty Month from April 7 through April 30. For all items returned in April that have fines, those fines will be waived. Note that this does not apply to past fines on your account – only for current overdue items. Broomfield Library invites all ages to Celebrate National Library Week! from April 7-13. Drop by the library any time during open hours for fun activities that you won’t want to miss. Eagle Valley Library District has introduced Automatic Renewals for Children and Teens. Starting April 1, 2019, the District is instituting automatic renewals for its eligible Children and Teen items. Eligible items checked out on April 1st or later will automatically renew three (3) days before they are due. Check out the FAQs for more info. The Colorado State University Source reports that NEH awards CSU $350,00 grant for Colorado Encyclopedia. The grant will be used to expand and enhance the Colorado Encyclopedia, an online compendium of information on life in Colorado, which can be visited here: coloradoencyclopedia.org. Grand County Library District director Tallie Gray explores online resources and other library services in the latest installment of Library Corner: eLearning from the Sky-Hi News. The Journal-Advocate reports on Burlington Library’s Seed saving workshop in the context of the efforts of the Rocky Mountain Seed Alliance, whose mission is to connect communities with the seeds that sustain them. Honestly, these are just <chef’s kiss> so good. 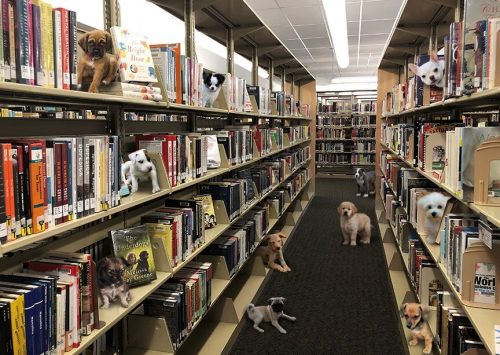 Meanwhile, Jefferson County Public Library introduced Borrow-a-Puppy, allowing card carrying patrons with zero experience to check out real live puppies – instruction manual, food, and poop bags included. Reader, I wish this had been real! Image courtesy of Jefferson County Public Library. 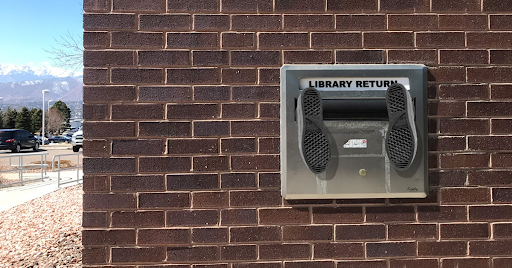 Finally, Pikes Peak Library District reminds parents not to put their children in the materials return slot. They were silent on the matter of other people’s children. Image courtesy of Pikes Peak Library District. Dolores Public Library invites patrons to Creative Crochet with Lynn Hardy on April 6 at 1:00 pm. Learn to make a simple market bag at this free class – materials are provided, but registration is encouraged. Call 882-4127 or stop by the desk to sign up! Get ready for Spring and build your feathered friends a Home Tweet Home with High Plains Library District on April 14 from 1:00-2:30 pm. Bring the whole family to build, paint and decorate a birdhouse to use in your yard. All supplies will be provided; all you need is your creativity. Fun for all ages! Registration required (one registration per family, please). 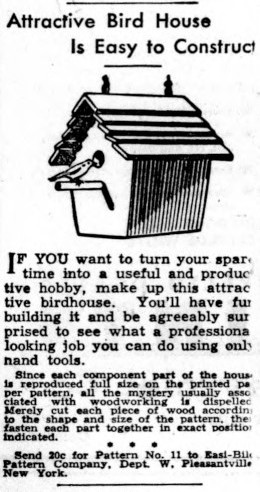 Advert in the Eagle Valley Enterprise, Volume 49, Number 25, April 8, 1949. Accessed via the Colorado Historic Newspapers Collection. Join Mesa County Libraries and Artist in Residence Julia March Crocetto for Creative Mending with Embroidery on April 9 from 6:00-7:30. After a short slide program, learn some stitches and methods to create patches with your creative flair. If desired, bring a pair of jeans or shirt in need of repair. Looking for a tastier way to be creative? Look no further than West Custer County Library’s Cinnamon Roll Workshop. Patrick McCaffery returns to the library to demonstrate the art of cinnamon rolls (at a high altitude) on April 12 from 1:30 to 3 pm. 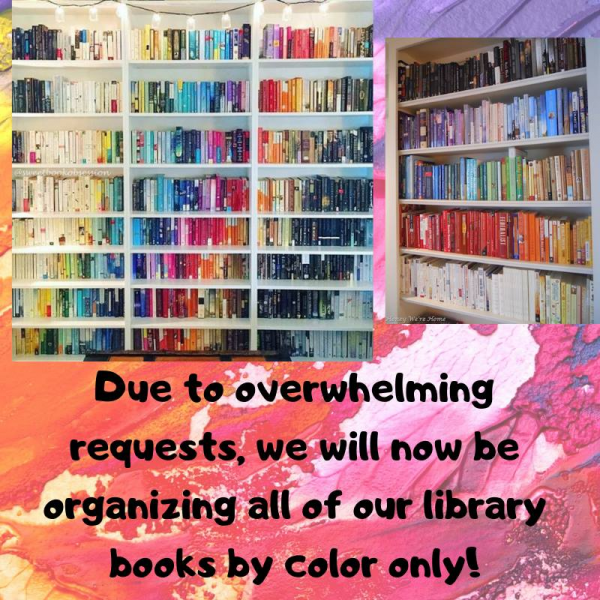 Space will be limited so please call ahead to (719) 783-9138 or email cathy@westcusterlibrary.org to reserve your space at the workshop. Curious about Library Supervision? Part I and II Registration is now open! Next Literary Libations: Get Lit with DPL and Denver Distillery!